In the early 1980s, producers created technology to take the plywood concept a step further. Rather than bond together thin veneers of wood, the new process allowed for the bonding together of small pieces, or strands, of wood. Called oriented strand board (OSB), the panels are cross-laminated, like plywood, and bonded together under intense pressure. Most panels have a nonskid surface on one side. As with a plywood panel, an OSB panel’s strength runs in both directions because of the cross lamination. 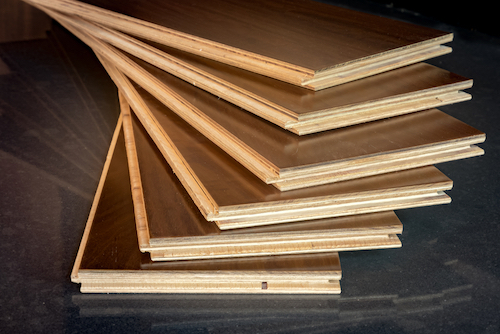 It’s cheaper than plywood, which is one of the reasons builders like it. The APA stamp on the panels identifies the end use of the panel. It also provides the span ratings for different products. For example, a product that can be used as subflooring or as sheathing for a roof may carry the designation 24/16. In this case, the left-hand number represents the maximum allowable span in inches between end supports when the product is used as roof sheathing. The right-hand number is the span rating for subflooring. The stamp also tells if the panel is designed to withstand the effects of repeated wetting and drying, called “Exterior.” “Exposure 1” panels are more suited to uses that are not exposed to the weather, such as subflooring. The thickness of the panel is also listed on the stamp. Standard panels are 4×8 feet. As with plywood, it is important to support the panel when cutting it to size. On the job site, builders usually cut panels using circular saws equipped with a plywood/OSB blade. These blades have more and finer teeth than the typical framing or ripping blade and produce a finer, cleaner cut than the framing blade.